MILAN (AP) Inter Milan was booed by its fans and outplayed yet somehow beat bottom club Benevento 2-0 to move to third in Serie A on Saturday. Two goals in as many minutes from Milan Skriniar and Andrea Ranocchia helped Inter to only its second win in 11 matches. Luciano Spalletti’s side moved a point above Roma and two above Lazio. Roma hosts AC Milan on Sunday, shortly after Lazio visits Sassuolo. ”The team isn’t good mentally, that’s clear, because of how we started the season and the expectations that were created, but it’s also true that at the moment we’re not reacting strongly, we’re not showing great character,” Spalletti said. Benevento, which remained 11 points from safety, felt it should have been awarded a penalty for Ranocchia’s challenge on Danilo Cataldi when it was still goalless. ”I’m disappointed because it could have changed the outcome,” Benevento coach Roberto De Zerbi said. ”Oversights sometimes favor you and other times punish you, in this case they punished us. When you come to these stadiums the calls you get are rarely equal. Inter, which has the derby against Milan next weekend, was dismal and it took less than seven minutes for the first jeers to rain down from the San Siro crowd. Its worst first-half performance of the season was spared by goalkeeper Samir Handanovic. Handanovic saved well from Benevento forward Massimo Coda, who went close again early in the second half but shot over the crossbar. Inter took the lead against the run of play in the 67th minute. Matias Vecino nodded on a corner for Skriniar to head in at the far post. Almost immediately, Ranocchia stooped to head a free kick into the bottom left corner. Benevento’s misery was complete nine minutes from time when Nicolas Viola was sent off for a second foul. Mattia Destro scored one and set up the other to help Bologna beat Genoa 2-0 and end their opponent’s good run. Bologna leapfrogged Genoa into 11th, safe from the relegation zone. 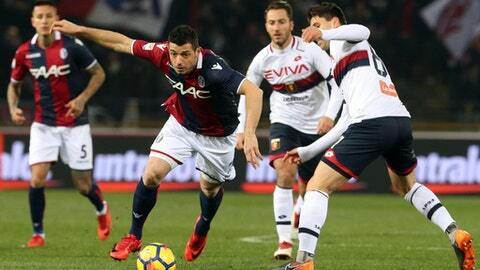 Bologna and Genoa were tied on points heading into the match, but Genoa was seeking a fourth consecutive win.